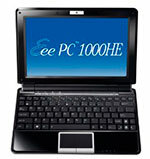 Posted on February 2, 2009 by Chad O.
Asustek has officially started promoting the new 10″ Asus Eee PC 1000HE. It’s one of the first netbooks to feature an Intel Atom N280 1.66GHz CPU. How much of an impact the N280 is on battery life has yet to be seen, but Asustek is making a pretty bold claim – up to 9.5 hours of battery life. The new CPU allows for a faster 667MHz front side bus (FSB) – the N270 had a 533MHz FSB. A major part of Asustek’s claim about the 1000HE’s battery life involves ASUS’ Super Hybrid Engine which helps regulate battery power by monitoring how the machine is being used and scaling back on the CPU speed, etc., in order to reduce battery consumption. An even bigger part is probably the included 6-cell battery which has been described as “high density”. We’ve seen 3rd parties offering replacement batteries for various netbooks in a higher capacity while maintaining the same number of cells, so it’s not surprising that an Asus Eee PC model would be rolled out at some point with a similar battery. Posted on February 1, 2009 by Chad O. It was bound to happen – somebody was going to take apart one of the new 12″ Dell Inspiron Mini 12 netbooks and that somebody was “ravic”. They’ve included plenty of photos as well. The pictures do show quite a bit of space, both for modding as the article points out, but for other uses as well. I keep wondering if Dell could have reworked a few things internally and added a 2.5″ SATA bay instead of the 1.8″ HDD shown. While it’s almost too large to be consider a netbook, the internal photos shows that it’s basically the same as Dell’s other netbooks. I would guess that it’s due in part to maintaining a close manufacturing base with the 8.9″ Dell Inspiron Mini 9. YOU CAN SEE THE 1.8″ drive (that limits your upgrade options) – it’s a Samsung HS04THB 40GB harddrive. One interesting thing – if you don’t order the Inspiron Mini with WWAN, there will be no WWAN slot inside for you to add it yourself later on. The WWAN antennas don’t come standard either. Posted on January 31, 2009 by Chad O. The new 10.2″ Intel Atom-based MSI Wind U120 just started showing up in stock or available for pre-order from various retailers, and now LAPTOP magazine has one of the first reviews. Not much has changed from the original MSI Wind U100 – the chassis was changed slightly in the design department, but the price is much lower than the Wind U100 originally started out. One thing that jumped out about the review – LAPTOP Magazine mentioned that the battery life was less than the original U100 when paired with a 6-cell battery. Another important thing that the review mentions (and you can see pictures of the bottom of the chassis) – there is no way to upgrade the RAM – you are stuck with whatever ships. This is not an upgrade-friendly netbook. The keyboard is the same as the U100, and the touchpad still does not support multi-touch (something some early models of the U100 did). With all of that said, it does start at $379 (depending on retailer and model) and that puts it down into the 8.9″ Acer Aspire One or Dell Inspiron Mini 9 range (albeit not as upgrade friendly as either). Several people have wrote to tell us that the 10.1″ Acer Aspire One D150 has started showing up for pre-order in the United States, at J&R. No exactly release date, unfortunately. The biggest news is that the four listed models are all priced at $349.99 USD after a $10 discount (around 272 EUR, 246 GBP). Pricier models had been listed in Europe. They do reflect the naming scheme we saw pop up earlier this week, namely Acer Aspire One D150 or AOD150, and it looks like all four colors (red, black, white, blue) will be available in the US. Of course, shipping is listed as 1-2 months and the price is listed at Â£349.99 (around $500 USD) Still, it’s good to see they are getting listed in the retail channels.